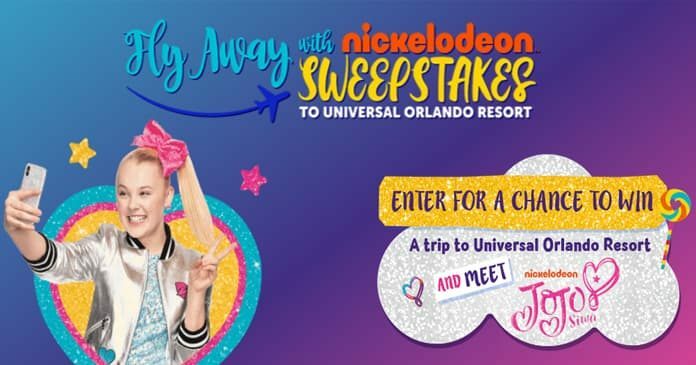 Fly Away With Nick: Meet JoJo Siwa At Universal Orlando Resort! You could win the experience of a lifetime with the Fly Away With Nick Sweepstakes. For your chance to win, ask a parent to go online to FlyAwayWithNick.com and enter the Fly Away With Nick Sweepstakes daily between February 11 and March 10, 2019. One lucky winner and 3 guests with meet Nickelodeon’s JoJo Siwa at Universal Orlando Resor, and experience both Universal Studios Florida and Universal’s Islands of Adventure theme parks, plus Universal’s Volcano Bay water theme park. Get your Parent’s permission if you are a Minor. Visit www.flyawaywithnick.com during the Sweepstakes Period. Complete the registration form by providing your first name, email address, and parent’s email. Completed entry form must be submitted in accordance with the online directions during the Sweepstakes Period. All entries must be received at the Sweepstakes Site by 11:59:59 p.m. ET, on March 10, 2019. The Fly Away with Nick Sweepstakes is open only to legal residents of the 48 contiguous United States and the District of Columbia and who are between the ages of 6 and 17 years old at time of entry or the parent or legal guardian of children between the ages of 6 and 17 at the time of entry. Begins on February 11, 2019 at 12:00:01 a.m. Eastern Time and ends on March 10, 2019 at 11:59:59 p.m. Eastern Time. Maximum of one Sweepstakes Entry per person/household/e-mail address, per day during the Sweepstakes Period. Administrator will conduct a random drawing from all eligible entries received during the Sweepstakes Period on March 11, 2019 in order to select one (1) potential winner of the Sweepstakes Grand Prize. For a winner list, send a self-addressed stamped envelope with proper postage affixed to “Fly Away with Nickelodeon Sweepstakes to Universal Orlando” c/o Marden Kane, Inc., 575 Underhill Blvd. Suite 222, Syosset, NY 11791-3416 for receipt by May 18, 2018. The Sponsor of the Sweepstakes is Viacom Media Networks, a division of Viacom International Inc., 1515 Broadway, New York, NY 10036. The administrator of the Sweepstakes is Marden Kane, Inc., 575 Underhill Blvd. Suite 222, Syosset, NY 11791-3416. Previous articleAlbertsons Monopoly 2019: What Are The Rare Pieces? Our baby girl almost died, August of last year, she is 9, she has 2 auto immune disease’s… an the whole time she was in the hospital, she had to watch Nick Cannon, & Jose…. she wanted to meet them one day !! I would love to make her dreams comes true !! BEST GIFT I COULD EVER GIVE MY MIRACLE BABY GIRL!!!! !